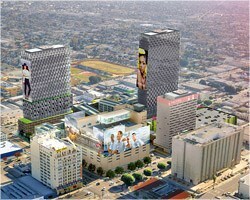 Mitchell M. Tsai, Attorney At Law represents SAJE in a lawsuit challenging The Reef Project in Los Angeles, a mixed use development in the City of Los Angeles set to develop 549 apartments, 895 condominiums, 160,000 square feet of retail space and a 208-room hotel on two city blocks near USC. SAJE recently arrived at an agreement with the developer of the Reef Project to settle the dispute. More information can be found here.